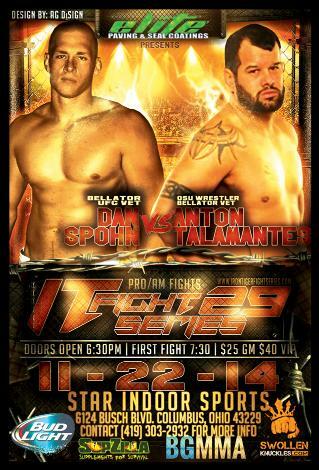 IT Fight Series returns back to the Capital City of Ohio... November 22nd at the Star Indoor Sports Arena!!!! And do we got a treat for you... when UFC vet Dan Dragon Spohn takes on OSU wrestler and Bellator MMA vet Anton Talamantes for the MAIN EVENT!!! Plus we even got more for you then that!!! Which includes another UFC vet and not 1 but 2 differnt title fights!!! This is going to be an action pack fight card with some great Pros and ammys from across North America!!! And this is all brought to you by our great sponsor Elite Paving And Seal Coatings!!! So make sure you make it out November 22nd and check out this great fight card which doors open at 6:30!!!! !